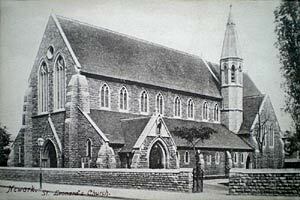 The foundation stone of the church was laid in April 1871 and it was consecrated in January 1873. The church was built on Northgate to serve the growing population of north-east Newark. It cost about £4,000, which was raised by subscription and the proceeds of some bequests. It was built of stone and consisted of chancel, nave, north and south aisles, turret tower, vestry, chancel, with two main entrances. The architects were Evans and Jolly of Nottingham. A Lady Chapel was proposed in 1904 but not built until 1921 when a Memorial Chapel was erected at a cost of £250 in memory of those who died in the First World War. St Leonard's closed in November 1978 and was demolished in 1979 shortly after a new church with the same dedication opened on Lincoln Road. Particular thanks to Prof John Beckett and Dr Chris Brooke for research on this entry.